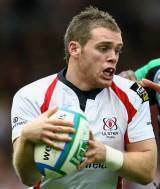 Darren Cave signed a professional contract with Ulster in March 2008, and has been turning in some excellent performances as they continue to improve. Cave has won international honours for Ireland at U19, U20, U21 and Sevens level, winning a Six Nations Grand Slam in 2007 with the U20 side. He was called up for Ireland's tour of North America in 2009 and won two caps, against Canada and the USA. However since then his ambitions have been limited to domestic and Heineken Cup rugby, becoming an influential player in Ulster's midfield.